CALVERTON, NY– Global Marine Power, Inc. is pleased to announce the design of the Hustler Shotgun. The Hustler Shotgun will become the 15th boat to join the Hustler line. Having UNIQUE design and a GIANT cockpit, the Hustler Shotgun will be a completely ORIGINAL design offered by no other manufacturer on the market today. The Hustler Shotgun scale model will be on display at the 2017 Progressive Miami International Boat show (In-Water Slip 381, 383, 385, 387, 389), with the product to be finished sometime in Summer 2017. Giant—cockpit that affords comfort w/ amenities for cruising, mooring or going fast. Due to popular demand, we are extending the Pre-order ($19.99 plus the cost of shipping) special another 2 weeks (November 14th)!! Shirts will be $29.99 after the special is over. 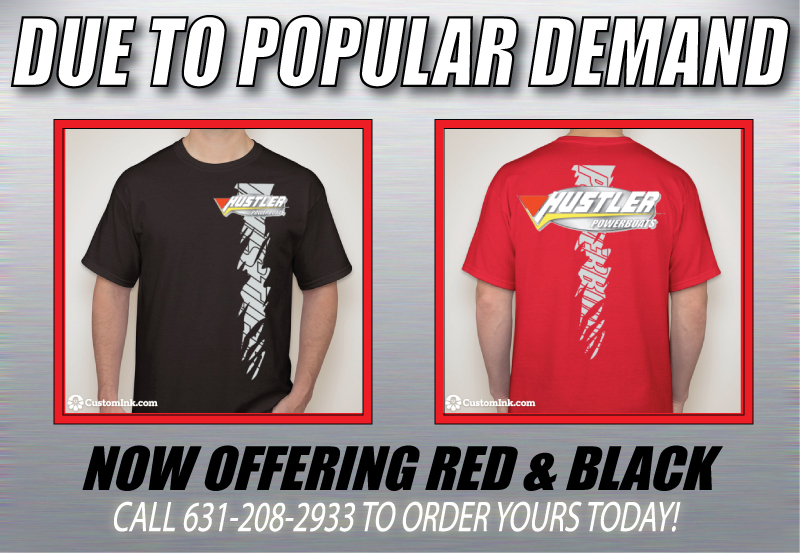 Shirts now will be offered in both Black & Red along with the white. Give us a call at 631-208-2933 to place your order for the T-shirts! CALVERTON, NY- Global Marine Power, Inc. is pleased to announce the addition of C & S Truck & Car Shoppe to the Global Marine Power, Inc. dealer network. The Global Marine dealer network consists of 15 dealers across the globe, and are hand-picked by the factory to offer products and service that exceeds expectations. Those who are interested in becoming a dealer for Global Marine Power should call the factory for more information for becoming a dealer. Checkmate Marine, a division of Global Marine Power, Inc. has been in business for 50 years, manufacturing 17 different models ranging from 18 feet to 30 feet. More information can be found by calling the office at 419-562-3881 or by visiting the website at http://www.checkmatepowerboats.net. Hey Hustler Fans! Looking for new Hustler apparel to wear alongside with your boat? We are releasing a new Hustler T-shirt design! Normally $30 plus shipping, we are running a special for the month of October for $19.99 plus shipping!! Call the shop at 631-208-2933 for more information and to order your shirts! Just wanted to say a special thank you to Joe, Paul, & MaryEllen and the entire Hustler crew in the shop. About 2 months ago, I had an incident with my boat, which there was quite a bit of damage and the trailer was totaled. I called Joe to describe what happened, and showed him some pictures of the damage. He quickly called me back, and told me to get my boat up to the Hustler Factory, and that he could have me back on the water in 30 days. In his own words, he said it would be better than new! After sending the boat up to the Hustler Factory, they kept me informed the entire time with pictures and phone calls. On day 30, he called me up to tell me to come and pick up my boat. When I got to the factory, the boat and the trailer was perfect! I just wanted to say, whether you are buying a boat or getting repairs done, that the people from Hustler are some of the nicest and most professional people I’ve ever dealt with in the boat Industry. Thanks again for letting me finish the season out. Thank you for the kind words John! You really helped brighten up this gloomy day. Customers like you are the reason we strive to get our customers back onto the water as quickly as possible! Have a safe and wonderful Labor Day Weekend everyone! Hustler also introduced a new Mid-Cabin to the market, the 29 Rockit MC, which features everything that the 29 Rockit is able to offer with an open-bow configuration. This particular model features a Mercury Racing 540 Engine with Bravo XR Drives and Livorsi Color Trim Tabs. See the pictures of the boat in the booth! At the 2016 Progressive Miami International Boat Show, Hustler unveiled a 25 Talon with twin outboards. The boat is complete with a seating area in the back of the boat, allowing people to get out of the elements when the boat is floating. This particular boat is powered with Twin Mercury Racing Optimax 300XS. The boat is also been completed with a black gel-coat bottom. See the pictures of the boat in the booth!